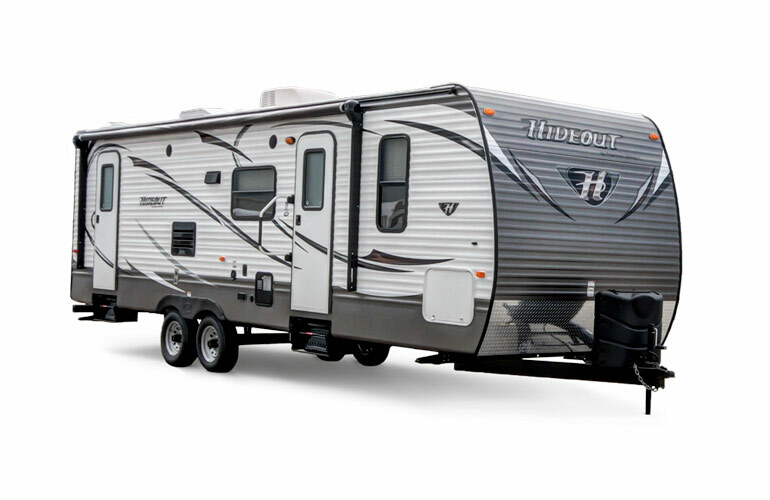 Designed to make your camping experience comfortable and convenient, Hideout Travel Trailers are the perfect choice for those who love to hit the road in an inviting space with all the essentials. Constructed on a continuous steel I-beam powdered coated frame with a one piece TPO roof, the Hideout lineup of travel trailers are durable and ready for the road. And with e-coat corrosion prevention wheels and added bonus features like rain gutters and a hurricane reinforced structure, you can rest assured that this trailer will stay safe in any weather. With a range of layout options and attractive decors, you’ll find the ideal Hideout travel trailer for your absolute comfort. And with residential features throughout, these travel trailers will make you feel right at home no matter where you travel. When you travel in a Hideout travel trailer, you can bring the whole family since most models sleeping up to six comfortably. Or, choose a bunkhouse model for room to sleep up to 10. Oversized storage throughout means you can travel with your gear, without having it overwhelm the space. 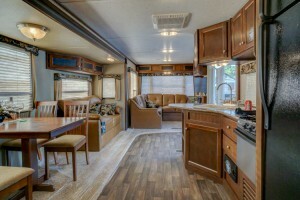 With this much practical use of space, you know that you’re getting optimal living space, and just imagine how much relaxation you’ll get in this travel trailer. Plush furniture and, depending on the model you choose, a freestanding dinette, create a cozy atmosphere ideal for a comfortable travel experience. 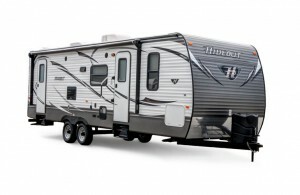 In a Hideout travel trailer, you’re going to get the features you want at a price that fits your life. And with modern amenities and the high standard of construction these trailers are known for, you know that you’ll be traveling in the ultimate of durable trailers. Interested in checking our this durable and absolutely beautiful lineup? Call us at 800-523-1904 or visit us at Moore’s RV in Ridgeville, OH today to see our inventory of Hideout travel trailers!